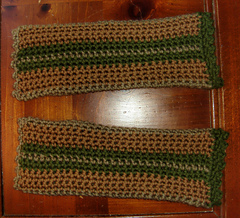 These mittens are made using a single crochet stitch. Crafted in one piece flat, and seamed by a slip stitch join the two sides lengthwise. Detailed with a bit of lace for edging with a picot stitch. These are the perfect mittens to keep your hands and wrists cozy during chilly days. Worked in merino wool.